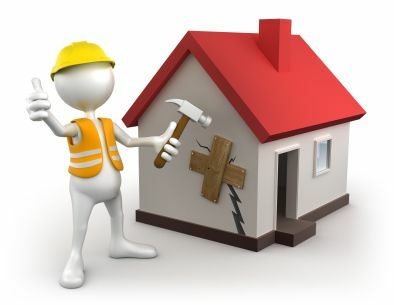 Your home may be the largest purchase you will ever make, so it is worth your time to keep it in good repair. Unfortunately, many homeowners fail to invest in maintenance before major systems start malfunctioning. To keep the costs of maintaining your property down, you need to focus on preventative maintenance. What you don’t want to do is create more work for yourself. The following are some common mistakes that home owners often make in the name of maintenance, or home improvement. Ceiling Fans: Ceiling fans are not ordinary light fixtures. Their weight, size, and motion require extra support. Never hang a ceiling fan from a light fixture box, or install it without the proper electrical connections or support. Improperly installed ceiling fans will be noisy, and potentially dangerous. Wooden Fences: To help prevent wood-destroying insect (WDI) problems, keep wood – including fences – away from the walls and foundation of your home. Use decorative rocks or other materials instead of wood mulch, and avoid nailing wood fence posts to the walls of the house. Permits: Before starting any home remodeling project, determine what permits and inspections are necessary. Check with your local building department or other regulatory agency to ensure that your project adheres to proper safety and local building codes. This can save you money in the long run, and prevent problems when you sell the house. Forgetting Annual HVAC Inspections: Every year, you should schedule air conditioning maintenance appointments. Inspection appointments such as these, are important to ensure that your heating and cooling systems are functioning properly. By skipping scheduling these vital inspections, you are most likely spending far too much on your heating and cooling utilities every month. Failing to Call a Professional for Major Plumbing Projects: You may be able to tackle the simpler tasks such as installing a new faucet, unclogging a toilet, but you shouldn’t ever take on major plumbing projects to save money on the cost of labor. Errors such as improper installation techniques and/or making a wrong cut, can lead to flooding and property damage, so it is in the best interest for a homeowner to hire a professional. This ensures that the work is done right the first time. Failing to Clear the Dirt and Debris: Everyone knows that dust and debris accumulates throughout their homes, and while most homeowner’s take the time to sweep, vacuum, and dust their homes, many of us fail to realize the importance of cleaning their air filters, air vents, and ducts. By not cleaning the air filter in your AC or ducts can lead to inefficiency, and will causes your system to work harder than it needs to. Taking the time to clean out your filters and vents, you can not only keep the air cleaner in your home, but you can also extend the life of your HVAC system. Failing to Clean Your Gutters: The gutters on your home are designed to direct water flow away from your property, preventing not only roof damage, but also water damage inside your home. By not cleaning out leaves and other debris from your gutters, you are preventing the proper water flow that will most likely cause this damage. Failing to Service Smoke Detectors: The smoke and carbon monoxide detectors in your home can save your life. Even though the newer models alert you when you battery is draining, testing your detectors regularly and ensuring proper functioning is very important. By doing this, you can help to prevent injury and property damage if disaster ever strikes. Hiring the Wrong Contractors: A lot of homeowners do believe in hiring contractors for the work done on/in their homes, but fail to do their homework before signing any contracts with them. Failing to hire a reputable and trustworthy contractor that guarantees on their work and offers accurate estimates can end up costing you quite a bit of money. Buying the Right Insurance: While all of these mistakes mentioned above involve maintenance, not buying the right type of insurance can be a major problem for homeowners. You need peace of mind in knowing that you are safe guarded when a major system in your home malfunctions and causes damage. Make sure that you sit down to review and discuss what is and what is not covered in your insurance policy with your agent. Owning a home may offer your more freedom, but along with this freedom comes a ton of responsibility. Make sure that you focus on preventing problems by staying on top of your home maintenance. .By avoiding these mistakes mentioned above, and making the right decisions when it comes to your home, you can save money and increase your well-being.